A 12-year-old girl presented with a first time seizure. 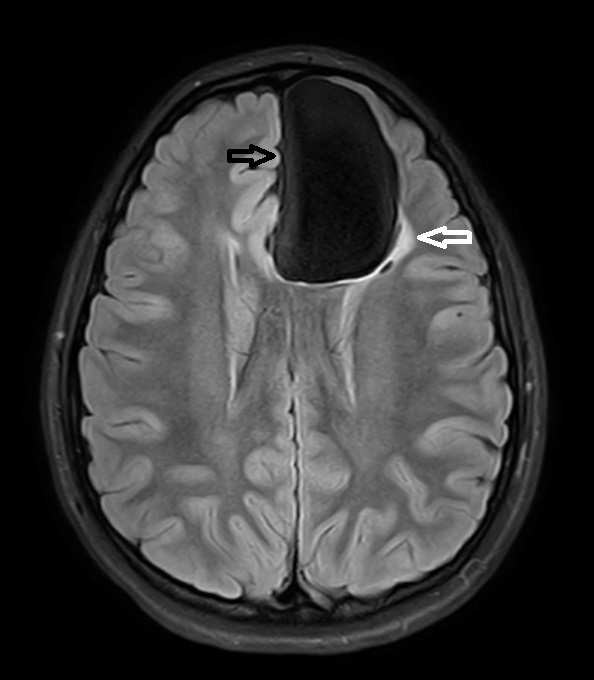 A CT scan was interpreted as interhemispheric arachnoid cyst. MRI revealed an interhemispheric cyst with left frontal lobe gliosis and cortical dysplasia, as well as aplasia of the rostrum and left genu of the corpus callosum. It was later elucidated that the patient exhibited mild cognitive delay. 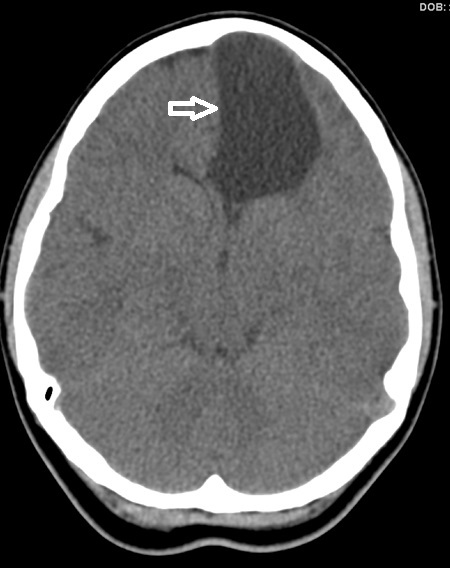 Axial nonenhanced CT [NECT, Figure 1) shows an extra-axial, left parasagittal mass associated with the anterior falx cerebri. The mass demonstrates homogenous fluid density and displaces the anterior left frontal lobe laterally. No calcification, parenchymal edema or hydrocephalus is present. MRI shows the mass to exhibit CSF signal on all pulse sequences. Axial ADC map (Figure 2) shows no restricted diffusion. Sagittal T2WI (Figure 3) shows the CSF signal intensity mass associated with aplasia of the rostrum and portion of the genu of the corpus callosum (CC). The remainder of the CC is well formed. No evidence of communication with the ventricular system. 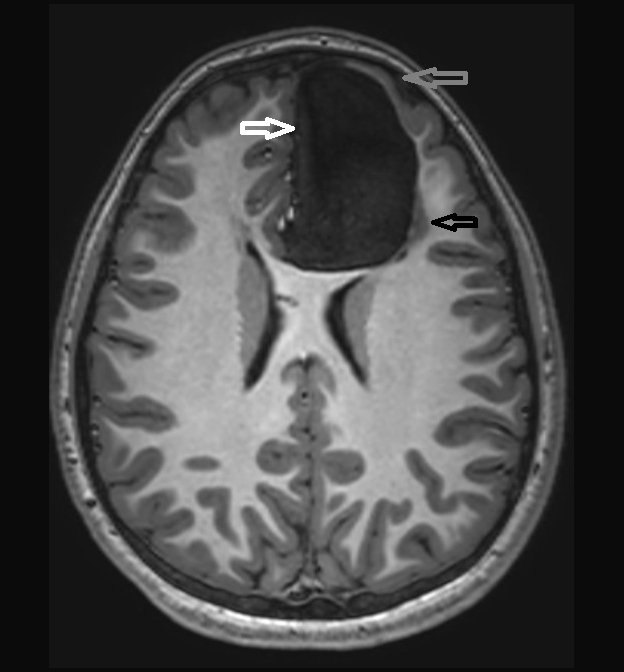 Axial FLAIR images (Figure 4) show homogenous fluid signal suppression with absence of normal grey matter bordering the cyst in the medial left frontal lobe. There is also increased signal indicating gliosis and/or dysplasia seen posterolateral to the mass with a single focus of cystic change and no evidence of communication with the ventricular system in the axial plane. 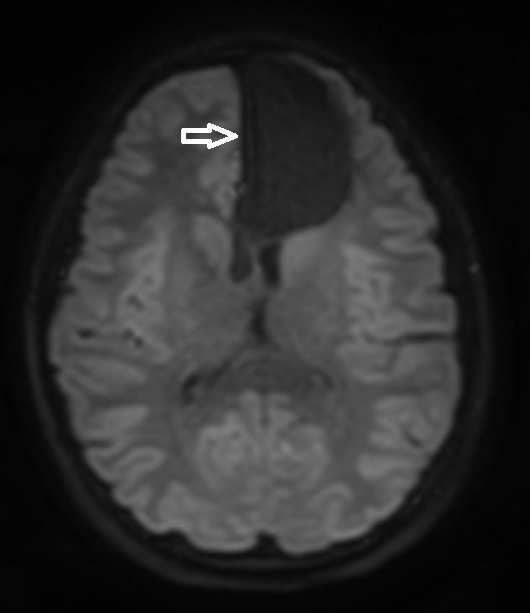 Axial T1WI (Figure 5) shows CSF signal mass with absence of normal grey matter in the displaced medial frontal lobe. The anterolateral left frontal lobe grey matter is thinned and dysplastic. 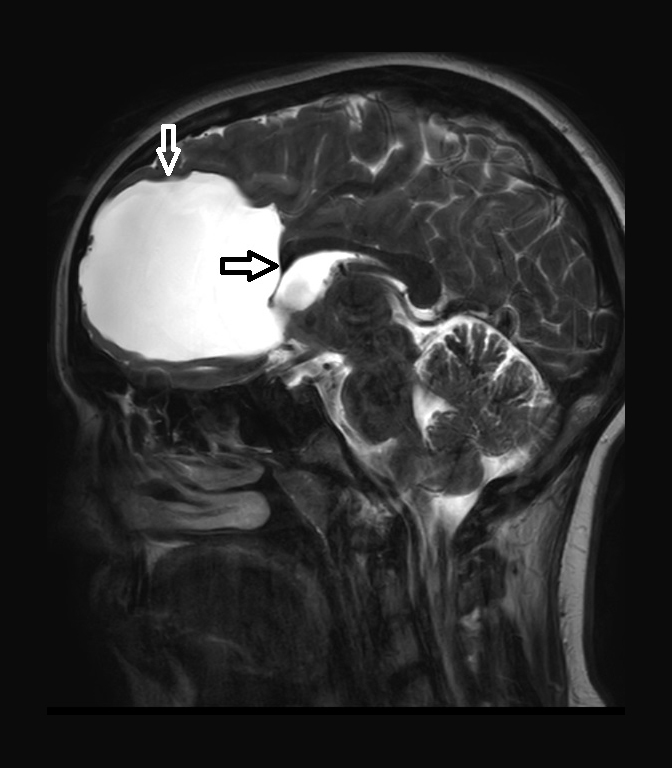 Interhemispheric cyst associated with partial agenesis of the corpus callosum. Differential diagnosis includes arachnoid cyst, porencephalic cyst, dermoid/epidermoid cyst, low grade cystic neoplasm (eg, ganglioglioma, DNET), and parasitic cyst (eg, hydatid disease). Callosal dysgenesis/agenesis and intracranial cysts are two common intracranial malformative lesions and their association has been well documented.1-7 Patients with that combination of anomalies are frequently identified in utero by sonography.1 Older infants may present with macrocephaly, neurodevelopmental disorders and seizure.2,3 The callosal deformity may range from complete agenesis to subtle segmental dysgenesis.1,2 How the cyst develops is controversial, but it is clear that cysts may not become apparent by imaging until late in gestation.1,4 Two basic types of cysts have been described.2,3 Type 1 cysts are likened to diverticula and communicate with the lateral or third ventricles. Type 2 cysts do not communicate with the ventricles. Several subtypes have been described based on associated anomalies such as hydrocephalus and dysplastic/heterotopic grey matter.2,3 There is evidence that type 1 cysts may form secondarily due to communicating hydrocephalus, and these cysts are primarily ependymal-lined.3 Pathologic evaluation for type 2 cysts may reveal arachnoid or glial-ependymal cells. Based on the classification scheme proposed by Barkovich, the case presented is a type 2c interhemispheric cyst.2,3 Type 2c associations classically present in childhood with seizures and developmental delay, and are associated with subcortical heterotopia. Ultrasound is commonly used as a prenatal screening tool, and both callosal dysgenesis and intracranial cysts may be identified. If callosal dysgenesis is identified prenatally, repeat sonographic evaluation is indicated prior to delivery to evaluate for macrocephaly and hydrocephalus.1,6 CT is a useful screening examination in the setting of seizure, but as in the presented case, often will not fully characterize associated abnormalities. MRI is the preferred modality for complete characterization of the congenital anomalies. In this case, the CT finding of a midline cyst was originally thought to represent an isolated arachnoid cyst, but MRI demonstrated the callosal dysgenesis and associated grey matter dysplasia with gliosis in the adjacent white matter. Interhemispheric cysts should not be dismissed as arachnoid cysts without complete characterization of the corpus callosum, adjacent cortex and involved white matter given the common association between these anomalies. Pavone P, Barone R, Baieli S, Parano E, Incorpora G, Ruggieri M. Callosal anomalies with interhemispheric cyst: expanding the phenotype. Acta Paediatr. 2005; 94(8): 1066-72. Barkovich A, Raybaud C. Pediatric Neuroimaging, 5th ed. Philadelphia, PA: Lippincott Williams & Wilkins; 2011. Barkovich A, Simon E, Walsh C. Callosal agenesis with a cyst: a better understanding and new classification. Neurology. 2001; 56(2): 220-7. Stroustrup S, Levine D. Appearance of an interhemispheric cyst associated with agenesis of the corpus callosum. AJNR. 2004; 25: 1037-40. Tange Y, Aoki A, Mori K, Niijima S, Maeda M. Interhemispheric glioependymal cyst associated with agenesis of the corpus callosum. Neurol Med Chir (Tokyo). 2000; 40: 536-42. Oh KY, Kennedy AM, Selden NR, McLean L, Sohaey R. Asymmetric ventriculomegaly, interhemispheric cyst, and dysgenesis of the corpus callosum (AVID): an imaging triad. J Ultrasound Med. 2012; 31(11): 1811-20. Crete R, Jorgensen SA, Towbin AJ, Towbin R. Interhemispheric cyst with associated dysplasia of the corpus callosum. Appl Radiol. 2018;47(10):27-29. Prepared by Dr. Crete while practicing at the Barrow Neurological Institute, St. Joseph’s Hospital and Medical Center, Phoenix, AZ; Dr. Jorgensen and Dr. Richard Towbin while practicing at Phoenix Children’s Hospital, Phoenix, AZ; and Dr. Alexander Towbin while practicing at Children’s Hospital Medical Center, Cincinnati, OH.